Reaction Engines Limited (REL) is a company based in Culham in Oxforshire, U.K. They are working on a novel propulsion system that can function as both a jet engine for flight in atmosphere and rocket engine for flights in space. The company hopes that the engine they are developing will transform the space launch market as well as permit hypersonic travel to destinations on Earth. In the past three years, REL has raised about a hundred and forty million dollars. This includes eighty-four million dollar from the British government, twenty eight million dollars from BAE Systems and thirty six million dollars from BAE Systems, Rolls-Royce, Boeing, Baillie Gifford Asset Management and Woodford Investment Management. In an interview, the REL CEO said, "Rolls are super-positive about the technology. They want us to be independent and innovative, and to push our technology as hard as possible. And Boeing - that's amazing. They are the world's biggest aerospace company, have decades of expertise and future plans that, for us I'm sure, will be really exciting." REL is working on the Sabre engine. This engine is intended to take off like a plane from a airport and soar into orbit around the Earth. It would perform like a regular jet engine up to a speed of Mach 5.5 which is over five times the speed of sound. Then it would convert to rocket mode for the rest of the ascent to orbit. The design of the Sabre engine includes a compact pre-cooler heat-exchanger that cools a one thousand degrees Centigrade incoming airflow to minus one hundred and fifty degrees Centigrade in one hundredth of a second. This feature allows the Sabre to use atmospheric oxygen instead of having to carry its own oxidizer during the first part of a trip to orbit. This reduces the weight of the vehicle significantly. 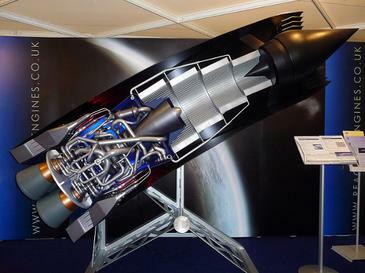 Most of the press about the Sabre engine talk about it in the context of an orbital launch system but it could also be used for fast trips on Earth. This summer in Colorado, REL will begin testing the pre-cooler technology with simulations of the hot airflow that the system will encounter at hypersonic speeds. The tests will be carried out in collaboration with the U.S. Defense Advanced Research Projects Agency (DARPA). By 2020, REL hopes to be able to demonstrate the full Sabre cycle. The next step will be to put the Sabre engine in an actual vehicle.